ACDelco VRLA (Valve Regulated Lead Acid) batteries are designed to offer high cranking power even in toughest of the conditions. The batteries offer excellent resistance to corrosion on the account of the alloys used. The rib pattern on the sidewalls help the batteries in withstanding tough temperatures, thereby making them very durable. Batteries come in factory-charged mode and are easy to install. Specially designed for Indian road conditions, protects against internal short circuit. Tata Green batteries have a leak proof and patented vent plug design. 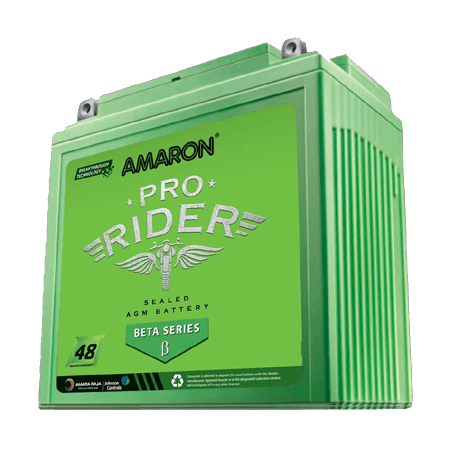 With excellent cranking performance and extended shelf life, these batteries are high on performance and reliability. HELLA offers Fit & Forget batteries (FF-48, 3 AH) , manufactured with state-of-the-art VRLA technology, for the entire range of two-wheelers available in India. VRLA technology works on the oxygen recombination principle, which prevents water loss and provides a zero maintenance battery. It means that the only thing on your mind will be to have the ride of your life, every time you start your engine. No matter what your ride, there's a HELLA Fit & Forget battery (FF-48, 3AH) that's going to last really long with you.